Films are traditionally screened for the "trades" before anyone else. Historically, when independent theater owners around the world booked their own theaters, they depended on Variety's advance reviews to plan their bookings. These days theaters are booked by accountants in Hollywood, often before a film has been completed. Now that it's "product," it doesn't matter so much if it's any good or not. Todd was always mindful that his review might be the first objective opinion a film received after emerging fresh from the lab. The first notice for a new director or star. The bellwether of a film's future. His reviews and all Variety reviews contain some judgment about a film's box office potential. In his recent review of the forthcoming "Remember Me," he predicted it "should enjoy a short but sweet B.O. life." That's about right. Todd was level-headed and fair. I am searching for a word. He was judicious. He knows everybody. He is known throughout the film world. He was Variety's ambassador at film festivals, always the best-known Variety person there. He stood for Variety. We now discover it did not stand from him. McCarthy and Flynn later edited Kings of the Bs (1975), a landmark anthology of writings and memoirs about auteurs of B movies past and present. Copies now sell online for as much as $186. In 2000, Todd wrote Howard Hawks: The Grey Fox of Hollywood. I ran into Todd in the early 1970s at the Sunset Marquis, the legendary hotel half a block down from Sunset near La Cienega. Elaine May had been in seclusion there for months, editing her "Mikey and Nicky." As I recall, the problem was that she had photographed the entire film in master shots, and it was a challenge to assemble. Todd was her assistant. We logged time at poolside, but he spoke only in prudent terms of Elaine May's project; he betrayed no confidences. He follows that sort of code. 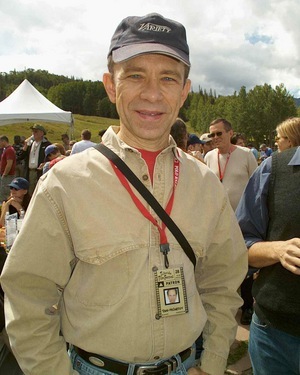 In the 31 years he wrote for Variety, I saw Todd countless times at film festivals. Every year at Cannes, Toronto, Sundance, Telluride. Those were just the ones I went to. How he produced such volumes of high-quality copy, I do not know; I was running as fast as I could, but he lapped me. Todd is tall, looks grave except when he smiles, is handsome in a Clint Eastwood way. He always has information to share about a last-minute screening or who has just arrived in town. He was the master of festival logistics. Quick, Todd! What in God's name is a "VIP screening room" at Toronto's Varsity? "Up that little ramp." 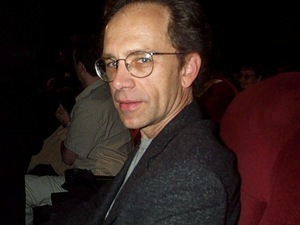 Todd directed four documentaries inspired by his love of film. The first three were "Visions of Light" (1992), the most intelligent film I've seen about cinematography; "Claudia Jennings" (1995), about the Playmate of the Year and B movie actress, tragically killed by a car on Pacific Coast Highway, who I believe Todd went to high school with; and "Forever Hollywood" (1999), described by Variety itself as "a valentine to both the movies and the town with which they've become synonymous," and intended to play daily to welcome visitors to the American Cinematheque in Los Angeles. 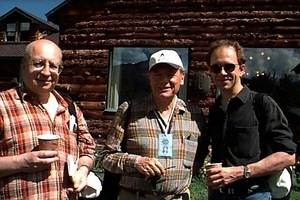 Then there was "Man of Cinema: Pierre Rissient" (2007), an extraordinary film about an extraordinary man (at left above at Telluride, with John Simon and Todd). I have written much about the film and its subject, and the links are below. Todd made this film as a labor love about a man who has tirelessly campaigned for the films and directors he loves (and often discovered) among a circle that apparently includes, for example, at least half of the directors, festival programmers, exhibitors and critics at Cannes. Pierre very often wears a T-shirt, and Todd liked to wear one quoting Pierre: "It is not enough to like a film. You have to like it for the right reasons." Todd always had reasons behind his reviews. They were clear and potentially helpful to filmmakers. His prose was considered. It began in the closing days of slangy Varietyese and evolved into a style fresh and witty. He didn't miss a thing. What I'm saying is that Todd McCarthy is not a man Variety should have lightly dismissed. He is the longest-serving and best-known member of the paper's staff, and if they made such a drastic decision, we are invited to wonder if Variety itself will long survive. Variety used to cover everything. I remember a magical night in Rome in 1967, when I sat late at night on the Via Veneto and gawked at the last remnants of la dolce vita. A held a copy of Weekly Variety, all black and white on newsprint and easily more that 100 pages thick. I became fascinated by the back pages, the items two paragraphs long about cabaret performers in Boston, dancers in Miami, magicians in Philadelphia, lounge acts in Las Vegas, jazz clubs in London. Variety got its name from variety artists, and for decades they lived off a favorable notice in its pages. The paper then truly was "the showbiz Bible." Well, those days over with. The glory days of the famous Variety critics are finished. I knew one of them, Gene Moskowitz, who signed his reviews Mosk., and was the Paris bureau chief who directed coverage at Cannes. In the 1970s, dying of cancer, he came to what he knew was his last Cannes, bringing along his wife and the young son he was so proud of. Under an umbrella on the beach, he looked toward the old Palais and said, "I saw a lot of good movies there." Another man of the cinema, another lover of T shirts. About Todd McCarthy I am not very worried. He's one of a kind. I can think of no better candidate as the director of a major film festival. Or as a professor, or of course as a film critic. What I lament is the carelessness with which his 31 years of dedication were discarded. Oh, the paper cites its reasons. "It's economic reality," Variety President Neil Stiles said of the move. Sometimes "downsizing" is necessary cost-cutting. Sometimes it symbolizes the abandonment of a mission. If Variety no longer requires its chief film critic, it no longer requires me as a reader. 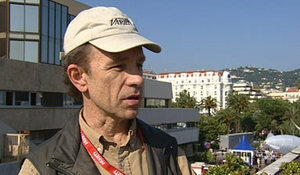 From the 2007 Toronto Film Festival: Pierre Rissient: One t-shirt after another. 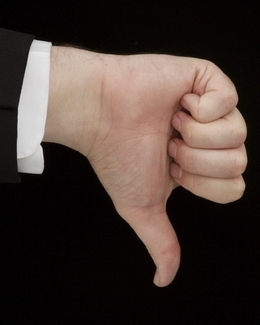 An early blog entry of mine: "Critic" is a four-letter word. "Jesus was a Nazi. So's your preacher"